EQUIPMENT: Rane mixers will be supplied by DMC. DJs cannot bring their own mixers. DJs must bring their own headphones, slipmats, needles, records, computers, cords, control vinyl and/or laptop stands etc. DJs can use any brand of needles they like. Promoter/sound will supply Technics turntables. TEAM FORMAT: Teams of 2, 3 or 4 DJs using up to 8 Technics turntables with analogue and/or digital mixers of DJs choice up to a maximum of 4. Any brand Digital Vinyl System (DVS), Loop Stations /External Hardware/ MPC’s (Roland RC20 or 50 for example) are permitted and are to be supplied by the competing DJs. Any stylus. Teams may consist of DJs of any nationality. DMC USA Team Champions advance to the 2012 DMC World Finals in London. 2pm-9:30pm. $15 adv. $20 day of. All Ages. 21 to drink. Absolutely NO FILMING permitted. Still photography is permitted. 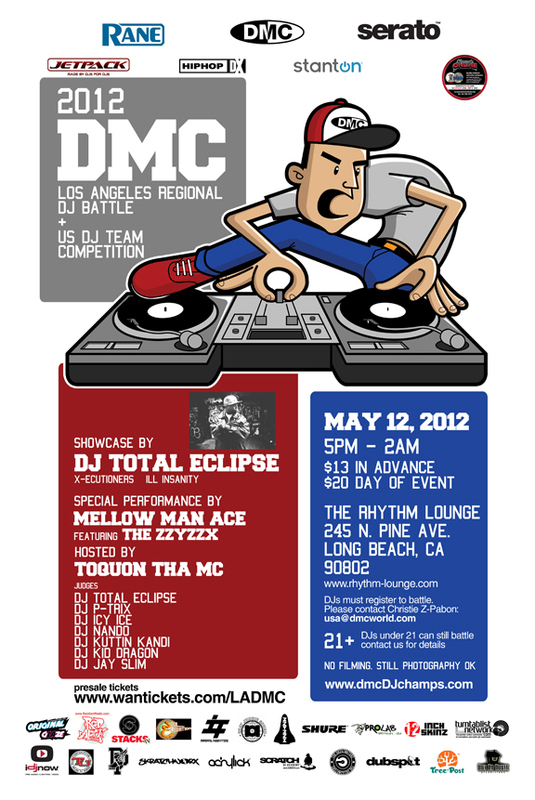 Round Trip Flight & Hotel Accommodations to battle in the 2012 DMC US Finals on Aug. 4 at Le Poisson Rouge NYC. Round Trip Flight & Hotel Accommodations to battle in the 2012 DMC World Finals in London! 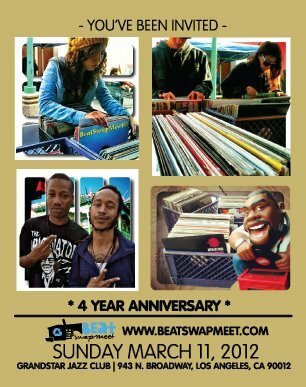 Literally Tons of Records for Buy & Trade, Outdoor Vendor Village with Dozens of Artists & Designers + the brands they’ve created, B-boy & girl Competition, Live Performance by 2Mex, Buyepongo, and many others. Open Cut Session, Producer Invite Upstairs, Kids Arts & Crafts outside, Bar Available for the 21+ and sooo much more. Resident DJ’s share rare selections from their record collections.. Vendors arrive as early as 9am for setup, we have Breakfast available & Coffee too, courtesy of Corazon de Jah, and local Chinatown cafes. Spend your Sunday under the California Sun. Outdoor Vendor Village featuring Dozens of Artists & Designers + the Brands They’ve Created..
Artists paint live.. Spontaneous drum circles.. Children ciphering.. !?!? Resident Chef (&DJ), MIGHTY JUNEBUGG, & her Rapper’s Delight catering crew will be on hand with your favorite foods you can only find at Beat Swap Meet. Resident Barber (&MC/DJ/Producer), SNAGNETO, fixing wigs all day, go home looking fly. Get your broken Turntable or MPC fixed! That’s right, we have onsite music-mechanics that will send your equipment home repaired. Open Cut Session, Hosted by DJ Jawa & friends. B-boys & Girls get down to there favorite grooves. It’s one thing to collect records, but can you dance to’ em? All Hardware, No Laptop’s, No CD’s. 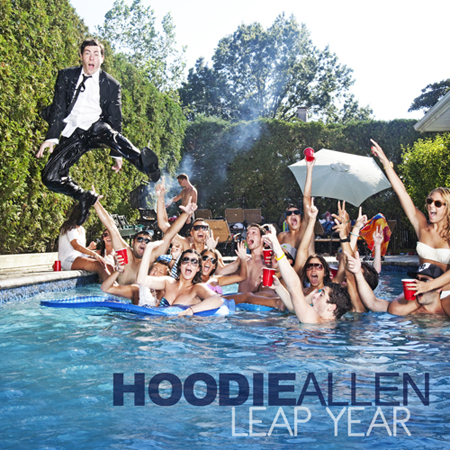 Celebrating this year’s leap year with a free mixtape from Hoodie Allen.